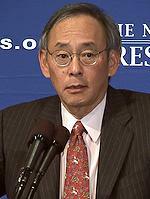 WASHINGTON, DC, November 30, 2010 (ENS) – The success of China and other countries in clean energy industries has created a new “Sputnik Moment” for the United States, Energy Secretary Steven Chu said Monday in a speech at the National Press Club. Secretary Chu was referring to Russia’s 1957 launch of Sputnik, the first Earth-orbiting artificial satellite. The United States, taken by surprise, was motivated the United States to accelerate its own space exploration program. In the United States, scientists are developing electric vehicle batteries that can power 500 miles of driving on a single charge, said Chu. The Nissan Leaf can travel 73 miles on a single charge, according to its U.S. EPA new vehicle sticker, while the Chevy Volt can travel 35 miles on battery power alone. With Recovery Act funding, Arizona-based Fluidic Energy is working with Arizona State University to develop a new generation of “metal-air” batteries that can store many times more energy than standard lithium-ion batteries, Chu said. A separate group of scientists at a new Energy Innovation Hub led by the California Institute of Technology in partnership with the Lawrence Berkeley National Laboratory, is creating an integrated system modeled after photosynthesis that can convert sunlight, carbon dioxide and water into usable fuels such as gasoline. Called the Joint Center for Artificial Photosynthesis, the effort has been awarded $122 million of Recovery Act funding over five years. Chu said this development could pave the way for a major expansion of America’s biofuel industry. The Obama administration has awarded more than $10 billion in loans and grants to boost electric vehicles, batteries and other advanced vehicle production. It will award another $16 billion in loans for advanced vehicles. Alternative Energy Vehicles. China has developed a draft plan to invest $17 billion in central government funds in fuel economy, hybrids, plug-in hybrids, electric and fuel cell vehicles, with the goal of producing five million new energy vehicles and 15 million fuel-efficient conventional vehicles by 2020. 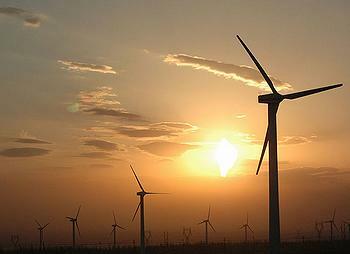 Renewable Energy. China is installing wind power at a faster rate than any nation in the world, and manufactures 40 percent of the world’s solar photovoltaic systems. China is home to three of the world’s top 10 wind turbine manufacturers and five of the top 10 silicon based PV manufacturers. High Voltage Transmission. China has deployed the world’s first Ultra High Voltage AC and DC lines – including one capable of delivering 6.4 gigawatts to Shanghai from a hydroelectric plant nearly 1,300 miles away in southwestern China. These lines are more efficient and carry much more power over longer distances than those in the United States. High Speed Rail. In the span of six years, China has gone from importing this technology to exporting it, with the world’s fastest train and the world’s largest high speed rail network, which will become larger than the rest of the world combined by the end of the decade. Some short distance plane routes have already been canceled, and train travel from Beijing to Shanghai – a distance roughly equivalent to New York to Chicago – has been cut from 11 hours to four hours. Advanced Coal Technologies. China is rapidly deploying supercritical and ultra-supercritical coal combustion plants, which have fewer emissions and are more efficient than conventional coal plants because they burn coal at much higher temperatures and pressures. Last month, Secretary Chu toured an ultra-supercritical plant in Shanghai which claims to be 45 to 48 percent efficient. The most efficient U.S. plants are about 40 percent efficient. China is also moving quickly to design and deploy technologies for Integrated Gasification Combined Cycle plants as well as carbon capture and storage. Nuclear Power. China has more than 30 nuclear power plants under construction, more than any other country in the world, and is researching fourth generation nuclear power technologies. Supercomputing. Last month, the Tianhe-1A, developed by China’s National University of Defense Technology, became the world’s fastest supercomputer. While Chu says the United States, and the Department of Energy in particular, still has unrivalled expertise in the useful application of high performance computers to advance scientific research and develop technology, the energy secretary warned that America must continue to improve the speed and capacity of its advanced supercomputers. Today, Chu announced the largest ever awards of the Energy Department’s supercomputing time to 57 innovative research projects, both academic and commercial research. Scientists will use computer simulations to perform virtual experiments that in most cases would be impossible or impractical in the natural world. The Department is awarding time on two of the world’s fastest and most powerful supercomputers – the Cray XT5 at Oak Ridge National Laboratory known as Jaguar, with capacity equivalent to 109,000 laptops all working together to solve the same problem – andthe IBM Blue Gene/P at Argonne National Laboratory, called Intrepid, with capacity equivalent to 26,000 laptops. The research could help speed the development of more efficient solar cells, improvements in biofuel production, and include partnerships with companies such as GE and Boeing to use sophisticated computer modeling in the development of better wind turbines and jet engines.